The first general meeting for SGA will be this Thursday at 5:00pm in WB 911 (Chicago). All students are welcome to stop by and learn about their new initiatives. In addition, this meeting will serve as meet and great social. Currently, SGA is looking for students interested in becoming senators! 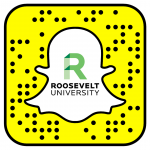 For more information on how to become a senator, send an email to sga@roosevelt.edu. The next SGA open meeting will be Feb 28 (Thursday) at 5pm in WB 911.